CAIRO — If the famed pyramids of Giza are the epitome of ancient Egypt, the chaotic road that brings tourists to the famed complex offers a bracing and authentic taste of the modern country. 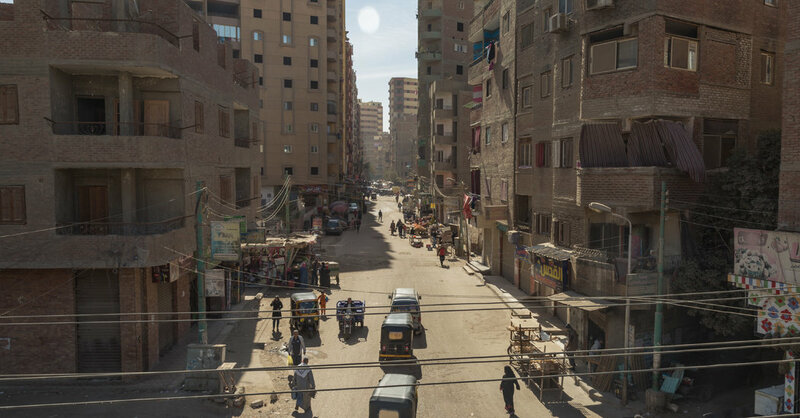 The Ring Road, a 68-mile belt of rutted tarmac, is Cairo’s suburban speedway, eight lanes of churning traffic with a hint of Mad Max. Souped-up clunkers and overcrowded buses, liberated from the clogged traffic of central Cairo, hurtle down the road, weaving perilously between lanes. Speed limit signs are treated as ornaments. Cars travel up ramps in the wrong direction. Motorists compare the drive to a thrilling video game. Fatal accidents are frequent; shootouts are more occasional. Early Thursday, three militants were killed in a gunfight with police officers at a checkpoint along the road, the interior ministry said. But it is the view from the Ring Road that most concerns President Abdel Fattah el-Sisi: the endless lines of rough, red brick buildings, smeared in dust and grime, that line the road as it swoops over the ashwariya, informal settlements where perhaps two-thirds of the 22 million residents in greater Cairo live. In January, Mr. el-Sisi ordered all such buildings across the country be painted in a uniform color. They look “uncivilized,” Prime Minister Mostafa Madbouly declared. A first priority is the ashwariya along the Ring Road. Muhammed Circa, a resident of one red brick building, sipped a cup of tea the other day in the cramped first-floor office of a lawyer friend that overlooks the Ring Road. He considered Mr. el-Sis’s grand plan to prettify his shabby neighborhood. “It will never work,” he declared. Mr. Circa was unhappy about government plans to make residents like him pay for their own paint job — or risk prosecution. His skepticism stood in sharp contrast to the priorities of Mr. el-Sisi, a strongman leader who greatly values appearances. Mr. Sisi has repeatedly lectured Egyptians for being overweight, urging them to exercise more. His military is building a gleaming new administrative capital in the desert outside Cairo, to draw Egyptians from the dilapidated city center. His desire for a red brick makeover was evidently prompted by a visit to the Grand Egyptian Museum, a sprawling $1.1 billion project under construction near the pyramids. Mr. el-Sisi plans an extravagant gala opening for next year, attended by world leaders, and he wants to spruce up Cairo before they arrive. Mr. Circa’s chief concern, though, is not the great pyramids of Giza pyramids but their smaller cousins: tiny stone models of sphinxes, Pharaohs and pyramids that he manufactures at a small workshop that has fallen on hard times. Since the Arab Spring of 2011, tourist numbers slumped while the stone to make his trinkets tripled in price. Now Mr. el-Sisi wants him to paint his home, on his own dime. It was a step too far. Mr. Circa’s friends, sitting quietly around him, looked uncomfortable as they sipped their tea. Public criticism of Egypt’s leadership can be dangerous; Egyptians have been jailed for saying less on Twitter and Facebook. Mr. Manshawi can afford to be bullish. He works in real estate, a thriving corner of Egypt’s otherwise moribund economy. Across Cairo, giant billboards advertise luxury compounds aimed at the rich: gated compounds with lush grass, glimmering glass and decidedly un-Egyptian names like Palm Hills or Hyde Park. But 40 percent of Egypt’s 98 million people live in neighborhoods more like the one they were sitting in, dust-blown locales with broken roads and tottering, often illegally constructed, buildings. Mr. Circa refused to pipe down. “I don’t care,” he said. “They’re telling me to paint my house and I have no money. What am I supposed to do? Not long ago, painting projects were a mark of exuberance and hope in Cairo. After the Arab Spring, energized young Egyptians partnered with foreign artists to paint the satellite dishes that dot their rooftops and create a sprawling mural across dozens of buildings in a neighborhood famous for its garbage collectors. Some schemes were overly creative. Last summer, a private zoo in Cairo became a laughingstock after customers realized it had painted white stripes on donkeys in an effort to pass them off as zebras. The giveaway was the fake zebras’ floppy ears and smudged stripes. Mr. el-Sisi’s painting project is driven by a desire for control and conformity. The details are still being hammered out, but officials have suggested that buildings in Cairo would be painted in earthy tones, while towns facing the sea will go blue. Critics question whether such a vast project is wise or even possible in a city of violent dust storms and infrequent rain. Mr. el-Sisi’s government says the plan is part of a bigger effort to upgrade such areas. Last year it announced, rather ambitiously, that it would eradicate all slums from Cairo by the end of 2019. Some have been skeptical, and the criticism is not appreciated. In December, Leilana Farha, the United Nations special envoy for housing, said she was “shocked” to discover that Egyptians she interviewed in Cairo’s poor areas a few months earlier had suffered harsh reprisals for talking to her. Some were flung from their homes by officials, their belongings strewn in the street. Others were harassed by the security services or barred from leaving Egypt. The foreign ministry accused Ms. Farha of fabricating stories and implied that she was a terrorist sympathizer, bent on smearing Egypt. Such defensive, conspiratorial talk is standard fare on Egypt’s television stations, which are heavily influenced by Mr. el-Sisi’s government. And it has seeped down into the street. In a mechanic’s yard just off the Ring Road, a group of men at first welcomed questions about the paint project. “If the rulers don’t want to see us, they should build a wall around us,” quipped a man who gave his name as Mahmoud. But within moments, their welcome soured. One man demanded to see my identity card. Another inquired if my pen contained a hidden camera. Back at Mr. Circa’s group, the pyramid maker and his friends drained the last of their tea. Ultimately, the paint directive didn’t worry them too much. Egyptian leaders have a habit of making grand pronouncements that quietly crumble. Before last year’s presidential election, Mr. Circa noted, the government threatened to fine voters who failed to cast a ballot. But in the end, few were penalized. In any event, Mr. el-Sisi won the flawed poll with a 97 percent majority. The painting edict would likely meet a similar fate, Mr. Circa predicted. “Nothing will come of it,” he said.